Everyone knows New Mexico is a photographer's paradise. Glorious color everywhere, fascinating cultures, great vistas. It's also becoming a passenger rail lover's paradise. And, a rail photographer's one as well. Here's a Rail Runner Express, departing the Sandoval County/Route 550 station near Bernalillo and Placitas, on its way to Albuquerque. 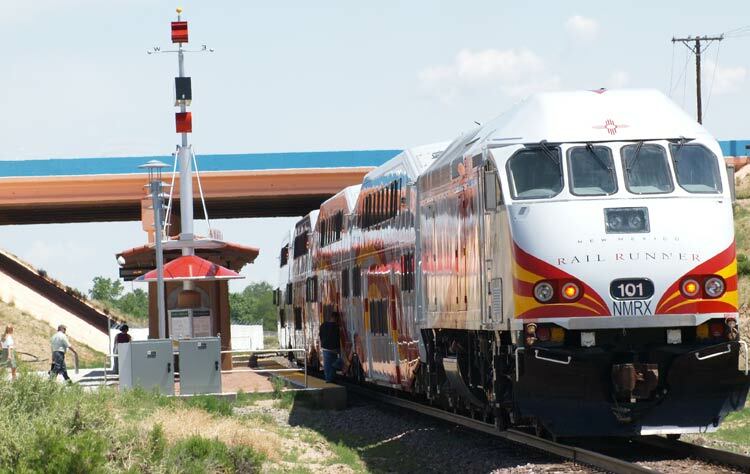 Within a year these colorful and popular trains will be plying the route up to Santa Fe, and the state of New Mexico has its eye on the Raton Pass route, currently owned by BSNF, for extending service on up into Colorado. Talk to New Mexicans of virtually all political persuasions and there are kudos for Governor Bill Richardson and the state legislature, and excitement about rail transportation as part of broad strategies for environmental protection and sustained economic development. Why can't our national government exercise such common sense? Camera: Olympus E-330 with a Sigma 55-200mm zoom lens. Here's Amtrak's northbound Adirondack arriving at the Ft. Edward, New York, station early in the afternoon of Sunday, August 16, 2007 on its way from New York City to Montreal. Running about a half hour late, the train shares the station, built in 1900 and listed on the National Register of Historic Places and serving about 6,500 passengers a year, with the Ethan Allen Express, which runs between New York and Rutland, Vermont. This part of the world feels in time warp, with old canals, Revolutionary War forts, and poor mill towns struggling to stay in the 20th century, not to speak of the 21st. The station itself is yet to be refurbished, but the train was gleaming and seemed to be carrying a lot of passengers. Camera: Olympus E-330 dslr, with Olympus 14-54 zoom lens. Here's the Ethan Allen Express, resting up in the Rutland, Vermont, station on the morning of Sunday, August 16, 2007, after its arrival (an hour late) the night before from New York. 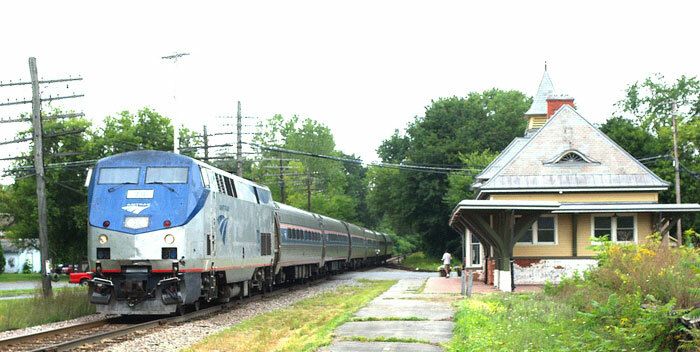 At 5:15pm it will depart for Fair Haven, Vt., Saratoga Springs, and points south on its weekend schedule. Rutland built an attractive station, now unstaffed, and an Amtrak employee I met worried the train may be discontinued due to low patronage and the fact that the Adirondack runs just a short distance away. But there is talk in the legislature of extending the run to Burlington at some point, so we can only hope there is a bright future. Camera: Olympus E-330 dslr with 11-22 Olympus zoom lens. It's, Sunday, November 4, 2007, a glorious late autumn day, and here's a Downeaster cruising through the unused station at Kennebunk, Maine, on its way from Boston to Portland. Soon it will pass though Saco, where a new intermodal station will soon be built. A continued success, the route now has five daily round trips, and continues to be a ridership and aesthetic marvel in the Amtrak system. Camera: Olympus E-330 with Tokina ATX 50-250mm PK mount lens. Changes last made on: October 28, 2007.